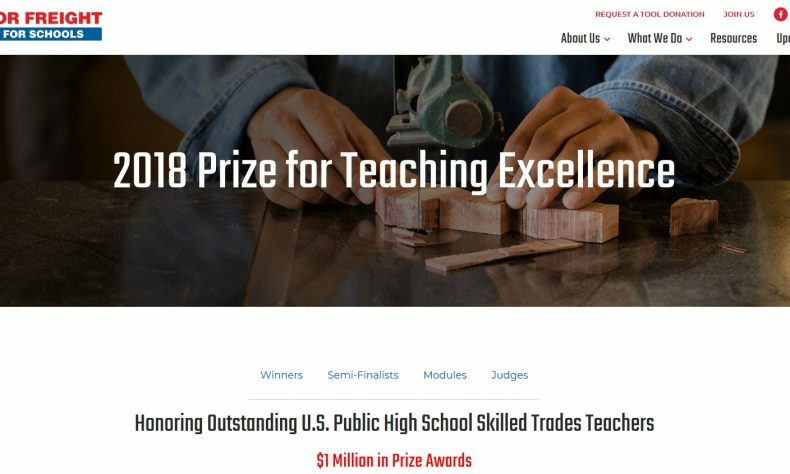 THOUSAND OAKS, Calif. — A building trades teacher in Bay City and a welding and woodworking teacher from Republic in the Upper Peninsula are among the winners in the 2018 Harbor Freight Tools for Schools Prize for Teaching Excellence. The competition awarded more than $1 million nationally to 17 first and second prize winners and semi-finalists. Andrew J. Neumann, a building trades teacher at the Bay Arenac Intermediate School District Career Center in Bay City, won one of three $100,000 national first place prizes. The prize includes $70,000 for the school’s building trades program and $30,000 for him. Matthew Barbercheck, who teaches welding and woodworking at Republic-Michigamme Schools in Republic, was surprised in his classroom by a representative from Harbor Freight Tools for Schools with the news that he and his school was among 14 second place winners who will receive $50,000 — $35,000 for the school’s skilled trades program and $15,000 for him. In addition to the more than $1 million in first- and second-place prizes awarded by Harbor Freight Tools for Schools, the Calabasas, Calif.-based company Harbor Freight Tools donated $34,000 — $1,000 each to the 34 semi-finalists. The competition was started in 2017 by Harbor Freight Tools founder Eric Smidt to recognize extraordinary public high school skilled trades teachers and programs with a proven track record of dedication and performance. The prize is awarded by Harbor Freight Tools for Schools, a program of the Thousand Oaks, Calif.-based Smidt Foundation. Andrew J. Neumann. Harbor Freight Tools for Schools photo. 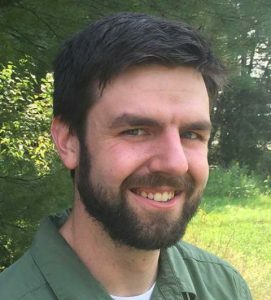 A fourth generation carpenter, Neumann joined the teaching corps following a four-year apprenticeship in carpentry and eight years as a journeyman carpenter, where he and fellow workers constructed homes, malls and large-scale projects at Michigan State University and the University of Michigan. With multiple professional certifications, including building inspector, plan reviewer, LEED Associate and NAHB Certified Green Professional, Newmann is also an accomplished academician, having achieved a Bachelor of Business Administration from Northwood University, an MA and Specialist in Education (EdS) from Saginaw Valley State University, and an EdD doctorate in education from Central Michigan University. Sharing his experience statewide, he was selected as a member of the inaugural Michigan Teacher Leadership Advisory Council, and is a consultant to the Associated General Contractors Workforce Development Committee and a member of the Michigan Career Pathway Alliance. He is also vice president of the Bay County Home Builders Association. 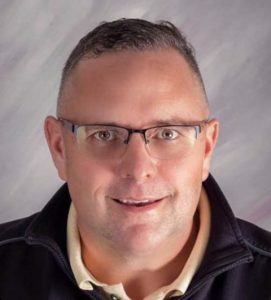 Neumann links the classroom with career pathways and tradespeople from the outset, working directly through relationships he has built with regional contractors and labor organizations to connect his students to training, testing, and soft skills for job preparation and interviews. The SkillsUSA chapter he belongs to advises at the school, and provides yet another way for students to demonstrate their abilities, and they are considerable: students in his class have won a first place in at least one skilled trades category in the national SkillsUSA competition for each of the last 20 years. As a capstone project, Neumann’s high school seniors annually design, build and market a new $250,000 home from the ground up. This significant, complex and multi-phased undertaking gives students the opportunity to learn and practice different facets of the skilled trades, figure out which one is most appealing to them, and build critical management and professional skills. His students learn not just construction technique, but a vast array of job skills and requirements, including attendance, work ethic, teamwork, mutual respect and accountability, and how to work in public on a high profile project in all weather conditions. Just as in their internships, they learn from the licensed contractors who install the HVAC, heating and plumbing at the new house. Matthew Barbercheck. Harbor Freight Tools for Schools photo. Matthew Barbercheck’s love for hands-on applied knowledge started with a “beginning auto” class when he was a high school senior. Barbercheck works to bring complex concepts to life for his students, like using a water balloon demonstration to show them how a stator and rotor work in an electric motor. He actively pursues opportunities that allow him to provide fresh content for his students, such as taking relevant side-jobs with a factory and a local builder. He models exploration and experimentation with students so that mess-ups are encouraged and ideas are explored. “I teach because every day I get to handle brain power, the most miraculous energy source. I’m farming a delicate and elusive crop, with plants of every variety. There is no monoculture in my job,” Barbercheck wrote in his application for the prize. The 2018 prize drew more than 550 applications from 49 states and included three rounds of judging, each by an independent panel that included experts from industry, education, trades, philanthropy and civic leadership. The field was narrowed this summer to 52 semi-finalists. The application process, which included responses to questions and a series of online video learning modules, was designed to solicit each teacher’s experience, insights and creative ideas about their approach to teaching and success in helping their students achieve excellence in the skilled trades. All learning modules are available at this link. For a list of the winners, visit this link. The high schools of the remaining 34 semi-finalists will each receive a $1,000 Harbor Freight Tools gift card to support their skilled trades programs.